Below is a powerful short essay by the great 20th century Kabbalist and founder of our Kabbalah Centre, Rav Yehuda Ashlag. Before reading it, I’d like to share some simple insights of Rav Ashlag and The Centre’s teachings so that the essays will be simple to understand. Similarity of Form is the essence of Rav Ashlag’s teaching and the Centre’s teachings. Rav Ashlag says no one in the world will truly grasp Kabbalah until they understand one fundamental concept — in the spiritual realm of consciousness, which is true reality, opposites repel and like forces attract, also known as like-attracts-like. The only reason the Vessel, we the souls of humanity and this physical earth, is separated from the Light and true reality, is because of our opposite form — our consciousness of receiving and self-interest, as opposed to the Light’s consciousness of sharing. We are opposite of the Light and Energy that emanates from the Creator so we consequently find ourselves in an opposite reality: death instead of immortality, darkness instead of Light, time instead of timeless, pain instead of pleasure, uncertainty instead of certainty, Godlessness instead of Godliness, lies instead of truth, chaos instead of order. We are in this world to transform our consciousness and behavior so that we may attain a similar form of consciousness and behavior as the Light of the Creator. The Creator shares and is the cause of Happiness. Therefore, we are here to share with others become the cause of their happiness. It’s that simple. But not easy to do. When we receive and strive to receive our own happiness we are opposite of the Light and that is why we experience an opposite world of the Light. This is why the ego is the sole cause of all chaos in our lives. 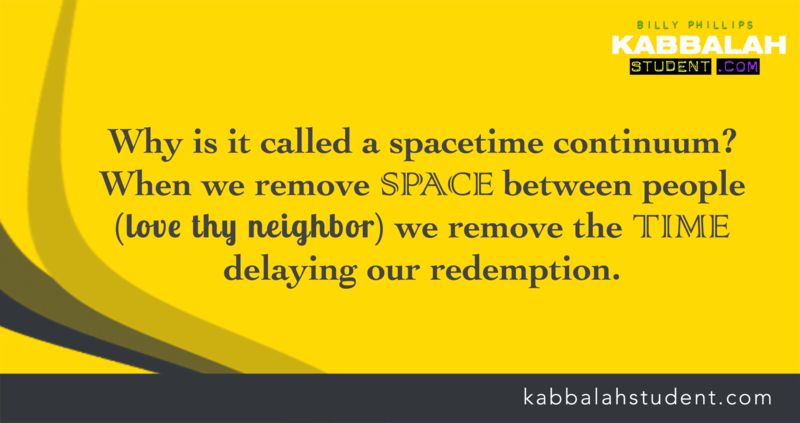 As Rav Berg explains, the path of Kabbalah — its wisdom and tools, including the Torah — are the conditioning agent and the methodology that gradually transforms our consciousness so that we will learn to receive for the sake of sharing with others. When our bodies, along with all of our innate talents and skills, are utilized in service of others, then our bodies are no longer considered an opposite form of the Light. Bingo! We have now attained Similarity of Form with the Light. When that happens, the gates of wisdom and blessings fling open wide and the world will be overrun with new technologies, ingenuity, wisdom and unity that will create a world of never-ending peace, paradise, including the biological immortal state for mankind. Until we get there, we develop technology and we engage in politics through trial and error and we do not yet have the formula for global peace and prosperity. And, our trial and error is based on self-interest instead being based on the betterment of all mankind. I have spoken already about the two ways of revealing the perfection of Geulah (Salvation, Redemption): the way of Torah and the way of pain and suffering. Therefore the Creator enabled people with new technology where they reached the level that they developed atomic bombs and hydrogen bombs. This indicates that if the future total destruction of the world that these bombs will bring to this world is not yet clear to people (because we did not transform using the tools given to us) than let the people wait for World War III or World War IV, heaven forbid. ואז יעשו הפצצות את שלהם, והשארית שישארו אחר החורבן, לא תהיה להם עיצה אחרת, אלא לקחת על עצמם עבודה הזו “שהן יחיד והן אומה לא יעבדו בשביל עצמם יותר ממה שצריכים לקיומם ההכרחי, ושאר כל מעשיהם יהיו לטובת זולתם”. ואם כל אומות העולם יסכימו לזה, אז יתבטלו המלחמות מן העולם, שהרי כל איש לא ידאג כלל לטובת עצמו אלא לטובת זולתו. Then, their bombs will do, and those who will survive after the destruction will have no other choice other than to take upon themselves this spiritual work. “Both the individual and the collective will work [and take] no more than what they need to sustain themselves and the rest of their activity will be to benefit the others”. And if the nations of the world will agree to that then there will be no more war anywhere in the world. After all, everyone will stop caring for themselves and start caring for others. ותורה זו של השואת הצורה היא תורתו של משיח, ועל זה נאמר: “והיה באחרית הימים, והלכו גוים רבים ואמרו לכו, ונעלה אל הר ה’ ואל בית אלקי יעקב ויורנו מדרכיו ונלכה באורחותיו, כי מציון תצא תורה ודבר ה’ מירושלים, ושפט בין עמים רבים והוכיח לגוים עצומים עד אין רחוק” (מיכה ד’). דהיינו שהמשיח ילמד אותם עבודת ה’ בהשואת הצורה, שהוא תורה ומשפט של המשיח ו”הוכחה לגוים עצומים”, דהיינו שיוכיח להם, שאם לא יקבלו עליהם עבודת ה’ ישמדו כל הגוים ע”י המלחמות. ואם יקבלו תורתו נאמר אז: “וכתתו חרבותיהם לאתים וחניתותיהם למזמרות לא ישאו גוי אל גוי חרב ולא ילמדון עוד מלחמה”. נמצא, שאם נלך בדרך תורה ונקבל תורתו, מוטב. ואם לאו, נלך בדרך יסורים. דהיינו שיתגלו המלחמות של פצצות אטום ומימן בעולם, ואז יחפשו כל אומות העולם עיצה, איך להמלט ממלחמות, ויבואו אל המשיח לירושלים, והוא ילמד אותם את התורה הזאת. It means that if we will walk in the way of Torah it will be for the better and if not, we will walk in the way of pain and suffering, that is, the wars of atomic and hydrogen bombs will be revealed in the world. All the nations will seek advice how to avoid war and they will come to the Messiah, to Jerusalem and he will teach them this Torah. I am just so full with love and Light because of Studding Kabbalah , thank you all for the teaching, you Billy and the Teachers in the Kabbalah Center in Israel and the Berg Family and also all of out there ! I can feel your beautyfull energy ! …thank you all love love love !